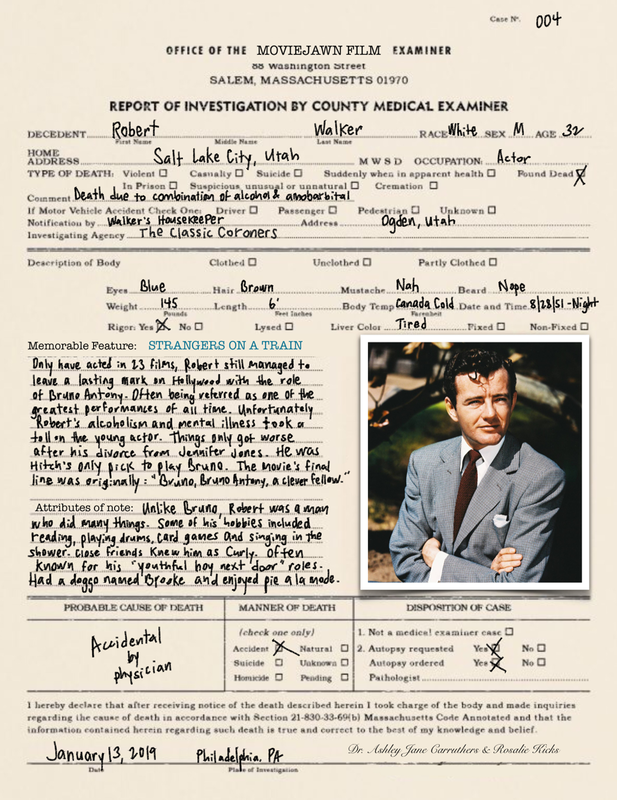 Robert Walker was born October 13, 1918 and died in 1951. At the mere age of 32 he was taken far too soon. Fortunately, one can still visit him within the motion pictures he left behind. One of his most famously known roles was in Alfred Hitchcock’s Strangers on a Train, in which he played Bruno Antony. His rendition of this character is unforgettable. Robert Walker plays Bruno Antony, a well-dressed, eccentric, nobody who still lives with his parents. Luckily for him, he was born with a silver spoon in his mouth, so his afternoons consist of kimonos and cocktails. It may come as a surprise that he leads a rather lackluster life with his charming and intriguing appearance. From head to toe, Bruno is dressed to the nines, oozing with class and sophistication. His demeanor is welcoming and will always encourage conversation; he invites it. With his ability to make long distance phone calls and obtain his own compartment on the train, his place is in society is easily defined. From his personalized tie tack embellished with his name, his flashy tie adorned with lobsters, to his two-tone patent leather shoes, Bruno has panache for a dude who claims to not have any particularly interesting skills. Despite this, even without speaking a word to Bruno, one can tell the wheels in his head are always spinning; he’s an idea man, not especially a go-getter though. He has plans but has never been strong in the execution part...until now. Even with his faults, he is a standup guy, a swell fella, the type that helps a blind man cross the street. It is easy to see why Bruno admires Guy (Farley Granger). Guy is a prestigious tennis player who has fallen in with the upper crust, but for us it is Bruno who should be admired. It is Bruno who has more compelling interests like…MURDER. Bruno’s impromptu meeting with Guy on a train is really where the story begins. Almost instantaneously Bruno takes a liking to Guy. Traveling on trains during the 1940s and 50s really seemed to have an alluring quality. You never knew who you would meet. Imagine how thrilling for Guy to meet someone that had the perfect plan to rid him of his meddling and troublesome wife? What are the chances? Is there an even more ideal place to hatch a murder, than a train? Bruno is everywhere, even when you least expect it. At the tennis court, the carnival and at that little place you grab your favorite cup of coffee. You’d even find him at the socialite party of the year, with the perfect weapon: his two hands. We would put money down, there wouldn’t be a better pair of hands to wrap around Aunt Fanny’s neck than a blueblood like Bruno. It is certain, Bruno is always there in a pinch willing and ready to do what’s necessary. It’s a simple concept, in theory. You take care of my murder, I’ll take care of yours. Is it “right”? Well, I mean. No comment. It seems as if Bruno had actually had this plan all along. Like it was something he just carried around in his back pocket until he found the right person to...involve. To his credit, Bruno does all the planning. He’s got it figured out. How he’ll knock off Guy’s wife, and how Guy will take care of Bruno’s father. He’s very organized. Who wouldn’t be drawn to such an organized individual? From their first meeting you can tell Guy is just laughing it off, but Bruno? Bruno is ALL IN. He’s charming about it all, he seems perfectly calm and...sane, but make no mistake - he wants to murder.